AMAZING facts about our cells !!!!!! There are approx 200 different "types" in our bodies ! Between 50 -70 Billion cells die in our body everyday ! Approx 2 Kg of our cells are Bacteria alone ! Life is both wonderful and majestic. Yet for all of its majesty, all organisms are composed of the fundamental unit of life, the cell. The cell is the simplest unit of matter that is alive. This standard is looking at the processes that happen at the cellular level and how factors such as availability of resources and the activity of enzymes can affect the cell. Antonie van Leeuwenhoek- observed the first living cells, called them 'animalcules' meaning little animals. I'm a little bit disappointing that this name didn't stick. Watch the You Tube video below to learn more about the "parts" of a cell and what function they have !! Watch the videos below to have a good recap/revision of Junior Plants and the process of Photosynthesis - any questions from the two videos below??? Is "undoubtedly the most important single metabolic innovation in the history of life on the planet" !!! SO.......Plants are able to produce Glucose molecules from carbon dioxide and water using light energy and the presence of chlorophyll !!! This process is ENZYME controlled every step of the way !! ​Where does this innovative cellular process occur?.....specialised organelles called CHLOROPLASTS. Actvity 1: Please watch this video and then respond to the following question below. The structure of the Chloroplast directly relates to the process of Photosynthesis. Lamellae = membrane structures - (extension of Thylakoids) that connect the grana together. A Chloroplast under the electron Microscope - spend some time on this diagram so you can confidently recognise the Stroma and Grana - you may just get a picture like this in externals !! Leaf adaptations and Internal leaf structure: both must link back to the process of Photosynthesis !! External Leaf Structure - just a wee reminder ! Cuticle: A waxy layer that prevent water loss by evaporation. The cuticle is transparent and very thin to allow maximum light penetration. Upper Epidermis: A protective layer of cells that produces the cuticle. The epidermis is is also transparent and very thin to allow maximum light penetration. 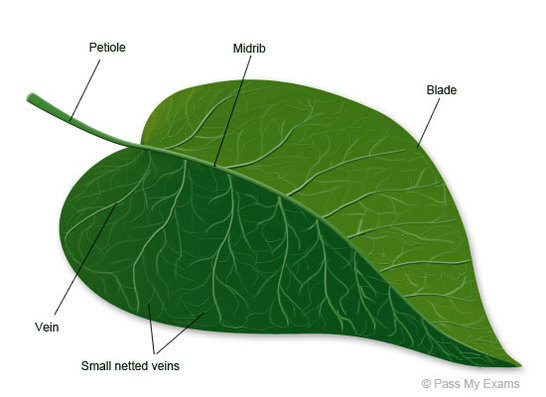 Spongy Mesophyll: These cells are smaller than those of the palisade mesophyll and are found in the lower part of the leaf. They also contain chloroplasts, but not quite as many. These cells have large air spaces between them that allow carbon dioxide and oxygen to diffuse between them. The air spaces also gives these cells a large surface area to maximise the diffusion of carbon dioxide into the cell and oxygen out of the cell. Vein: Plant veins consists of xylem (vessels that carry water) and phloem (vessels that carry dissolved nutrients such as sugar). These vessels play an essential role in transporting water to the chloroplasts in the mesophyll tissues for photosynthesis. They also transport the sugar produced by photosynthesis away from these cells to the rest of the plant tissues to be used as an energy source or stored. Lower Epidermis: A protective layer of cells. The lower epidermis produces a waxy cuticle too in some plant species. The lower epidermis contains pores called stomata that allow carbon dioxide and oxygen to move in and out of the plant respectively. Stomata: Tiny pores (small holes) surrounded by a pair of sausage shaped guard cells. These cells can change shape in order to close the pore. In very hot conditions water inside the leaf evaporates and the water vapour can escape through the stomata. Closing them prevent reduces water loss, but also limits the diffusion of carbon dioxide and oxygen in and out of the leaf. 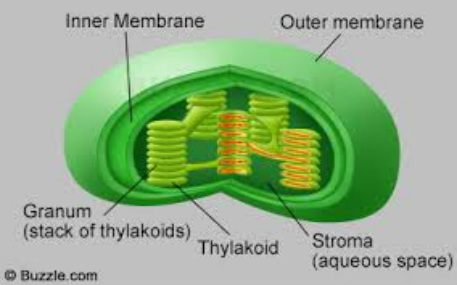 Takes place when the chlorophyll in the Thylakoid membranes (of the grana) absorbs light Energy. The light rays excite the chlorophyll molecules and their electrons- these get released. Their Energy is used: to make ATP AND split the Water molecule (Photolysis) - splitting by light - occurs in the Grana. The H2O molecule is split into H and 02 gas - O2 gets released (O2 is not needed for rest of process so effectively released as a waste product) Yay… we use this ! The H is picked up and carried by a special carrier molecule -NADPH to the second stage of the process and into the Stroma. Click here for a recap of information on the Mitochondria - the POWER HOUSE of the cell. It occurs in all living cells all the time! Cellular respiration is the process by which the biochemical energy of "food" /Glucose molecules is broken down and released in the form of ATP = (re-charging ATP). Very simply - breaking down Glucose to produce ATP ! ATP - adenosine Triphosphate - is the so called "Energy Molecule" recognised by all cells and is used to fuel all chemical reactions. During Aerobic respiration - one single Glucose molecule will produce/recharge 38 ATP molecules !! -it involves a series a complex Enzyme controlled reactions. Carbohydrates, fats, and proteins can all be used as fuels in cellular respiration, but glucose is most commonly used as an example to examine the reactions and pathways involved. It occurs in special organelles called MITOCHONDRIA ! It is a series of Enzyme controlled reactions that produce ATP. Its purpose - to recharge ATP ! ALL living things Respire, day and night ! Where in the cell does it happen ? Respiration can be Aerobic or Anaerobic In Animals -Aerobic Respiration occurs in most body cells  - it requires oxygen for the complete breakdown of Glucose molecule. Anaerobic Respiration - in animals - occurs when oxygen is in short supply typically in prolonged exercise and only occurs in muscles. The purpose of aerobic respiration is to release energy from food. It is needed for metabolism, growth, movement etc. C6H12O6 + 6 O2 → 6 CO2 + 6 H2O + Energy (ATP). Adenosine triphosphate and Adenosine diphosphate are more or less the same chemical. 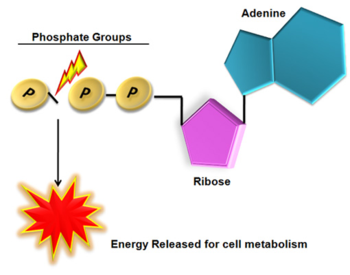 The Energy from the Glucose metabolism adds a high energy Phosphate bond to the ADP to make ATP. *****see below for more on ATP. Pyruvate loses a C to CO2 forming an acetyl group - this cannot exist alone - so is carried/held by Co-Enzyme A into the Matrix. Co - enzyme forms an important link between the Cytoplasm and Matrix. Carries the H atoms from the matrix into the Electron Transport Chain onto the cristae of the Mitochondria. Adenosine triphosphate is a small energy carrier molecule that can be used by all the different cell organelles and is required in virtually every cellular process. ATP carries this energy in a chemical bond between the second and third phosphate. When ATP is used in cellular process (by enzymes), this bond is broken releasing the energy stored in the bond. The resulting products, adensoine diphosphate (ADP) and a phosphate ion can be recycled / recharged through the process of respiration which converts them back to their high energy form (ATP). An active cell requires millions of ATP molecules each second. A working muscle - recycles its ATP at a rate of 10 million molecules per second. 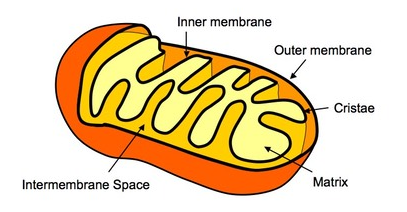 The number of Mitochondria in a cell varies widely by organism and tissue type. There are many more in Animal cells than Plant cells. Some cells may have a singly mitochondria whilst some have up to several thousand. The higher the ENERGY demands/requirements - the greater the number of Mitochondria. Eg: muscle cells/glands have high numbers of Mitochondria with many folds/cristae !! They can reproduce themselves - have their own DNA and protein building machinery. STAGES of RESPIRATION...click here for more.. Occurs in the absence of oxygen -only Glycolysis takes place - only 2 molecules of ATP are produced from each Glucose molecule. In animals this occurs when oxygen is in short supply in prolonged exercise and only occurs in muscles. The Pyruvate formed in Glycolysis is broken down into Lactic Acid - this causes Muscle Fatigue. The muscles need to stop working - to allow replenished supplies of Oxygen to continue the efficient breakdown of the Lactic Acid into Carbon dioxide and water. Both Photosynthesis and Respiration is controlled every step of the way by special biological catalysts called Enzymes: - these are PROTEINS that speed up the RATE at which these reactions can occur. They catalyse reactions based on a model called the Induced Fit Model. Learn more by clicking here on Enzymes !! Enzymes temporarily combine with the chemicals involved in a reaction. These chemicals are called the substrate. The combination is called the enzyme- substrate complex. When the enzyme and substrate combine, the substrate is changed to a different chemical called the product. The enzyme is not consumed or altered by the reaction. The part of the enzyme where the substrate binds is called the active site. Enzymes are highly specific and will only bind one type of substrate. It was originally suggested that this was because an enzyme and substrate both possess specific complementary geometric shapes that fit exactly into one another. This is often referred to as "the lock and key" model. An enzyme only fits one particular kind of substrate in the same way that a lock only fits one particular kind of key. The lock and key model was later revised slightly. Since enzymes are rather flexible structures, the active site is continually reshaped by interactions with the substrate. As a result, the substrate does not simply bind to a rigid active site; the part of the protein which makes up the active site is moulded around the substrate for an even more precise fit. This very slight change in shape (conformation) is what allows the enzyme to carry out its catalytic function. Co-factors and Inhibitors - how do they affect Enzyme action ??? ?...click here​ for info and examples ..
ANOTHER important Cell Process ......The "Transportation of Materials" into and out of the cell. 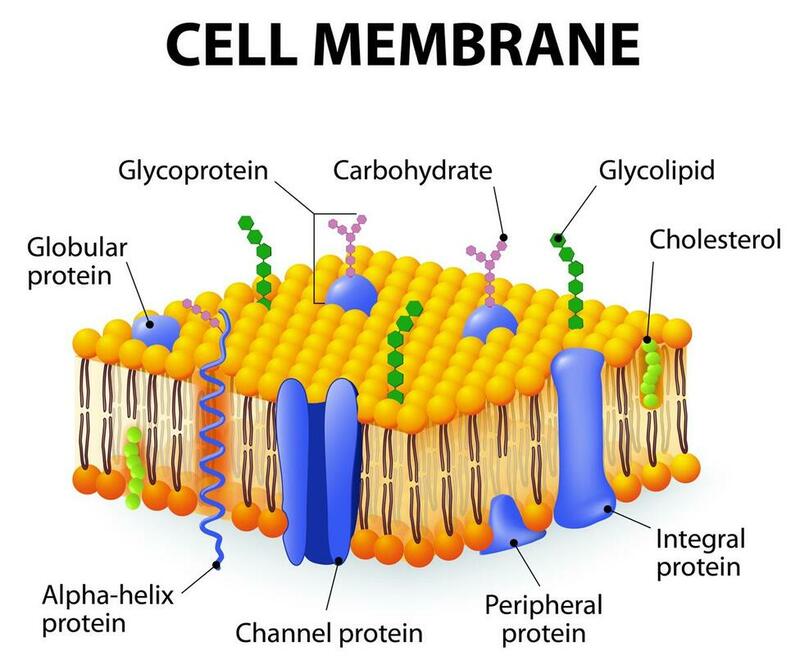 WHO is the key player....The CELL MEMBRANE !! This regulates and controls what comes into and out of the cell (selective permeability) and provides protection from the surrounding environment. The movement of materials across the cell membrane is highly regulated. This regulation is possible because the membrane isselectively permeable -not all substances are capable of moving across it. Some smaller hydrophobic (non-polar / fat soluble) molecules are able to diffuse directly through the membrane. Many charged molecules (ions) are unable to diffuse through the lipid layers of the membrane, while other molecules may simply be too large. The transport of most substances is mediated by specialised carrier proteins embedded in the membrane. These proteins not only regulate what crosses the membrane, but also when substances are able to cross the membrane. For instance during vigorous exercise more glucose must be released into the blood-stream and absorbed by our muscle cells. Cell membranes are a double layered sheet called a Phospho lipid Bi-layer - Lipid is anther name for fat and phospho -refers to phosphate groups that is attached to it - each phospholipid molecule is arranged with the Hydophilic head (water loving) facing out and and the Hydrophobic tails (water fearing) facing inwards. This keeps the inside water in and outside water out. This arrangement also prevents the phospholipid molecules packing too tightly together and keeps the membrane flexible ! This model is also sometimes referred to as the Fluid Mosaic model.....read here to find out more about this term. The movement of materials such as oxygen, carbon dioxide, glucose, mineral ions nutrients across a cell membrane maybe Passive or Active Transport. This is the NET movement of molecules from an area of HIGH concentration to an area of LOW concentration. It occurs because molecules have a natural tendency to exist in equal concentrations ie: as a single concentration. The word diffusion is actually derived from the Latin word, "diffundere", which means "to spread out" (if a substance is “spreading out”, it is moving from an area of high concentration to an area of low concentration). The difference between the two areas either side of the Plasma membrane is called the Concentration Gradient. 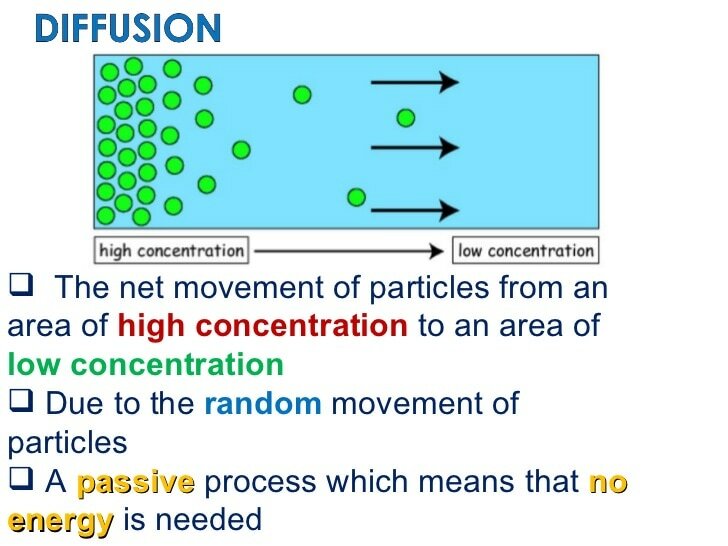 If there is a large difference in concentration = a steep concentration gradient = a steep line = diffusion is faster. If the difference is not so great = concentration gradient is not so steep = diffusion rate is slower. This the movement of molecules from an area of High concentration to an area of Low concentration with the aid of a specific protein carrier. (It is a passive process.) The molecules may be too large and cannot pass through the cell membrane by simple diffusion so are "facilitated" across by a specific carrier protein. 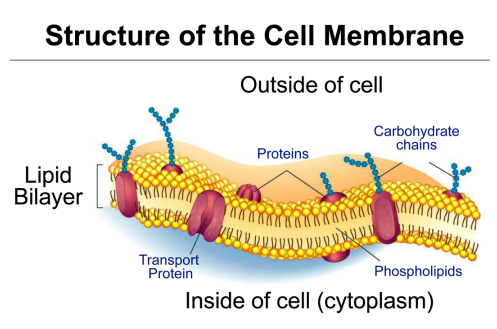 Because the cell membrane is impermeable to most electrically charged molecules and water-soluble substances such as Glucose and Amino Acids - these require assistance - the special carrier proteins embedded in cell membranes provide channels for these molecules to pass through. Carrier proteins are very specific ie: carry only one type of molecule. Eg: Cytochrome P450 can transport O2 up to 1.8 times faster than it does by simple diffusion. Check out here notes on how" Cell Size "affects diffusion for Cellular Transport and its efficiency. ! ​Is a special type of Diffusion BUT is all about WATER only !!!! - it is the movement of WATER particles from an area of HIGH concentration(so low solute) to an area of LOW water (so high solute) across the semi-permeable membrane. A strong or concentrated solution (high concentration of solute) is a Hypertonic solution. Two solutions with the same concentration (ie: same concentrations of water & solute) are isotonic solutions. A hypertonic solution causes water to move out of the cell and the cell becomes shrivelled. Red blood cells develop a star-shaped appearance that resembles a spiked ball (they become crenated).An isotonic solution does not result in any net movement of water in / out of the cell and so it remains unaffected. Osmoregulation is the control of water inside a cell or organism. 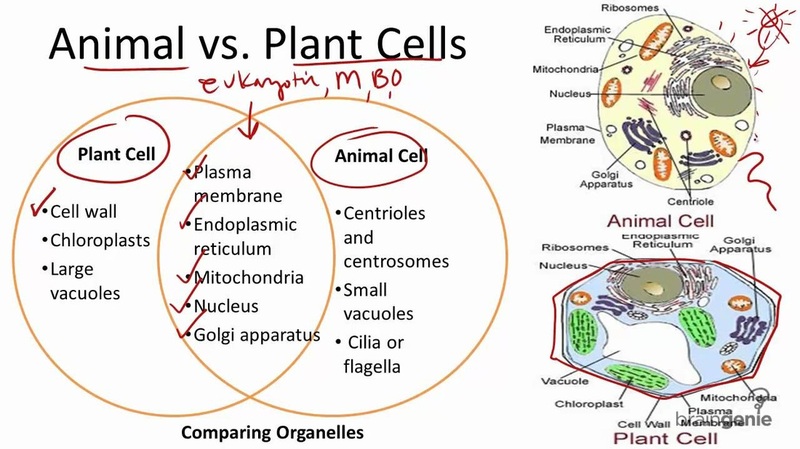 Depending on whether a cell is a plant or animal cell and depending on what type environment it is in will depend on the way it can "osmoregulate". Have a cell wall ie: this is a rigid wall surrounding the membrane - so this changes the effects of osmoregulation - when a plant cell is fill with water - its cell membrane has pressure on it cell wall - this is termed "turgor pressure" and the cell is said to be "turgid" . 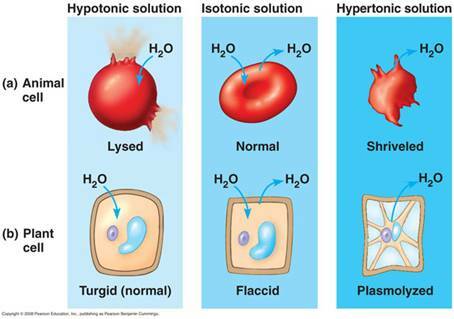 In Hypotonic solutions - Plant cells gain water - plant cells become firm as water fills the vacuole and the cell membrane pushes against the cell wall - so cells are said to be Turgid. The cell wall stops the plant cells from bursting. The "Tonicity" of Cells....What does this really mean ??? See here for some notes to help with this and what it means for cells !! Temperature – Particles diffuse faster at HIGH temperatures than they do at LOW temperatures because the warmer a particle is the more Kinetic Energy it has. STATE – gas particles diffuse FASTER than particles in a liquid. *** Be prepared to transfer this information into the context of any question on Diffusion....especially the idea of temperature !!! Active transport is an active process that requires energy (ATP). ACTIVE transport...want to know more? 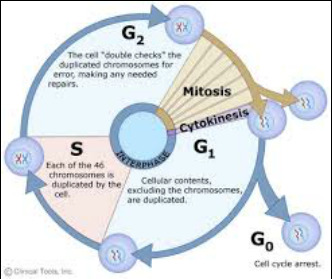 The stages in the cell cycle, are interphase (G1, S, G2, mitosis and cytokenisis) You do not need to know the names! Interphase: Divided into 3 phases; Gap Phase 1 (Cell grows larger), Synthesis (Genome is replicated, Gap Phase 2 (seperates the newly replicated genome. Mitosis: Include four stages (prophase, metaphase, anaphase, telophase). Spindle fibers attach to the chromosomes and pull sister chromatids apart. It seperates two daughter genomes. Cytokinesis: Division of the cytoplasm to form two new cells. Interphase is an active period in the life of a cell during which many metabolic reactions occur such as protein synthesis, DNA replication and an increase in the number of mitochondria and/or chloroplast. The purpose of DNA replication is to produce two identical copies of a DNA molecule. This is essential for cell division during growth or repair of damaged tissues. DNA replication ensures that each new cell receives its own copy of the DNA. DNA replication is where the DNA in the cell makes an exact copy of itself prior to cell division so that there is a full set of genetic information available in each cell after division has occurred. Why is it called semi conservative? 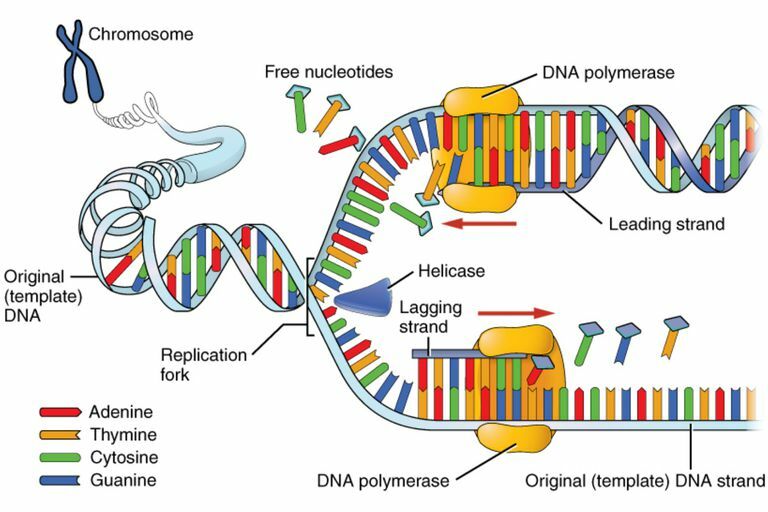 Semi-conservative replication is so named because each molecule of DNA that is created - contains one newly synthesised strand and one old/original parental strand - ie has a "conserved" strand. 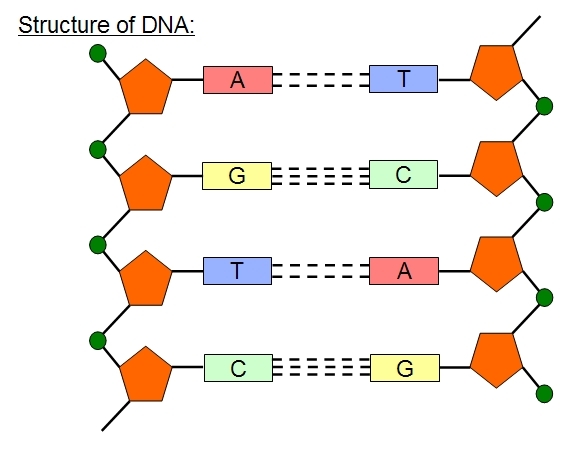 The semi-conservative nature of DNA replication is possible because of the base pairing rules. 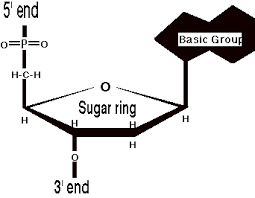 Helicase breaks the weak H bonds between the base pairs and therefore exposing the base pairs. Each original parent strand acts as a template/pattern to be copied from to form the new strand. Two new polynucleotide chains are then formed. ​Because the DNA molecule is anti-parallel and DNA is always built from a 5'---3' direction the nucleotides can only ever be added onto the 3'end of the polynucleotide chain. SO......Replication of the leading strand is continuous and can be copied directly, but replication of the lagging strand is fragmented into sections called Okazaki fragments and then DNZ Ligase bonds these sections together. DNA polymerase can only synthesise DNA in a 5' → 3' direction (because nucleotides can only be added to the 3' OH). One strand can be synthesised continuously as DNA Polymerase can simply follow-on behind DNA helicase as it unwinds the two strands. This is known as the leading strand. The other stand, known as the lagging strand must be synthesised in short bursts. On this strand DNA Polymerase moves away from the replication fork. ​As soon as DNA Polymerase has finished copying one section another section has already been unwound by DNA Helicase and is waiting to be copied. Thus the lagging stand is synthesised in sections called Okazaki fragments (after the scientist who discovered them). Enzyme Ligase joins these fragments together ensuring the lagging strand becomes one continuous strand. Because the two strands are anti-parallel biologists found it necessary to some how label the two strands accordingly. Eventually it became common practise to refer to one end of each strand as the 3' (three prime) end and the other end of each strand as the 5' (five prime) end. This is actually based on the sugar molecules within each strand. The carbon atoms in the sugar molecule of each strand can be numbered starting with the carbon that is bound to the base and going clockwise from there. You will find that at one end of each strand the 5th carbon is bound to the phosphate at the end of the strand. At the other end the 3rd carbon has an OH group at the end of the strand. 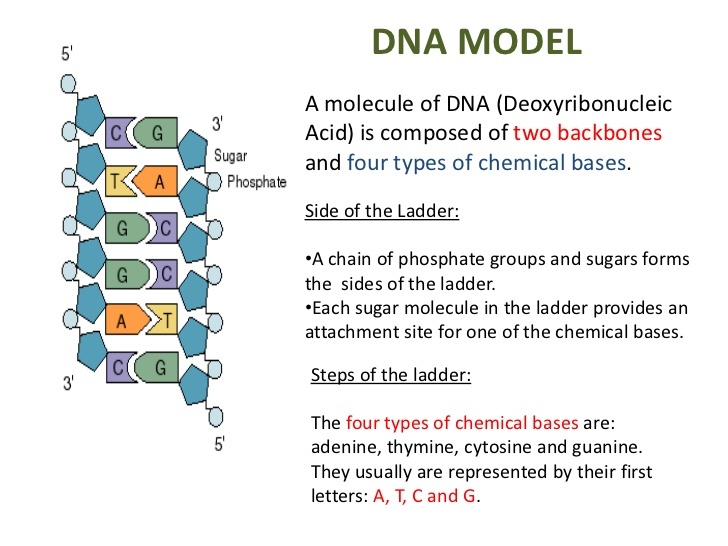 DNA nucleotides can only be added to this end and the phosphate of a free nucleotide will form a bond with this OH group. MITOSIS - A type of cell division for growth, repair, replacement. Cells divide in the process of Mitosis allowing growth to occur and worn-out or damaged cells to be replaced. Mitosis produces two new daughter cells that are genetically identical to each other - so that they can continue to carry out essential life processes. 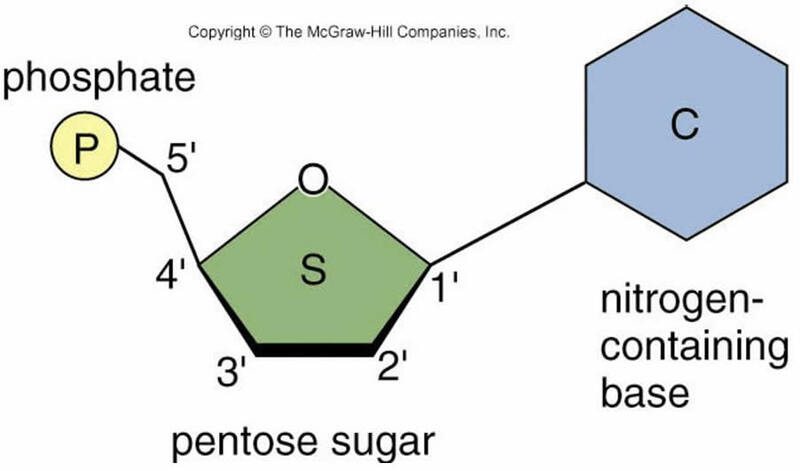 The following can slow down mitosis: temperature, pH, presence of mutagens such as alcohol or radiation, availability of raw materials/essential nturients in the cell. Mitosis is usually higher during periods of growth and repair during infancy / childhood / early development in animals AND following the breaking of dormancy, and during seasonal growth in plants following damage to the organism when repair of tissue is necessary. Mitosis rates increase in areas of cellular repair, the site of damage. Mitosis rates increase in Cancer cells. Prophase: The spindle microtubules are extended from each pole to the equator. Metaphase: Chromatids move to the equator and the spindle microtubules from each pole attach to each centromere on opposite sides. Anaphase: spindle microtubules pull sister chromatids apart making the centromeres to split. This brings the sister chromatids apart, splitting them into chromosomes. Each identical chromosome is pulled to opposite poles. Telophase: Spindle microtubules break down, while chromosomes uncoil and therefore are no longer individually visible. The nuclear membrane now reforms. ​ The cell then is divided by cytokinesis to form two daughter cells with identical genetic nuclei. Click here for more info on this if needed..